Fear Free Veterinary Care Now Available! Developed by “America’s Veterinarian,” Dr. Marty Becker, the Fear FreeSM initiative aims to “take the ‘pet’ out of ‘petrified’” and get pets back for veterinary visits by promoting considerate approach and gentle control techniques used in calming environments. 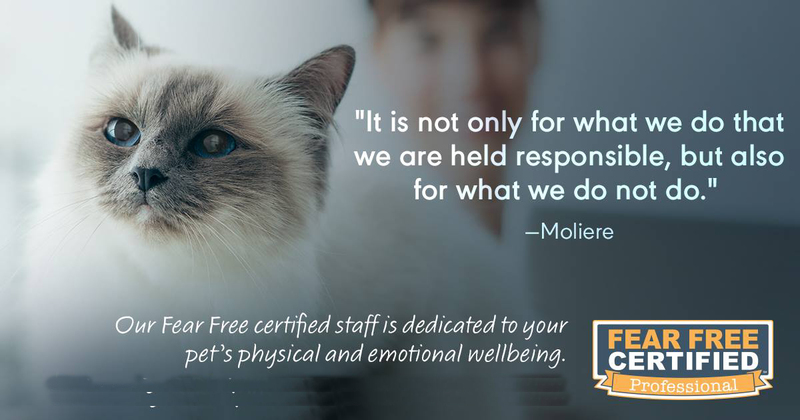 Utilization of Fear Free methods and protocols leads to reduction or removal of anxiety triggers, which creates an experience that is rewarding and safer for all involved including pets, their owners, and veterinary health care teams. To learn more about us, see what our patients’ families have to say! Give us a call at 480-895-3223 to learn more detail about ‘Fear Free Practice‘ !